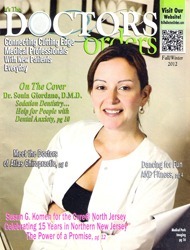 On the cover of the Fall/Winter 2012 edition of Doctors Orders, Dr. Sonia Giordano, D.M.D. makes an appearance for her commitment to excellence and practices with Sedation Dentistry, helping those with Dental Anxiety. Starting her career at the young age of 16 with Dr. Spiesman dental office she gained an appreciation for the occupation of dentistry and a passion for the dental arts. After graduating the of top her class at the University of Medicine and Dentistry of NJ her dedication, expertise, and experience has paid off. With the approval of the American Dental Association she has now helped thousands of families in the recent years by providing the latest and best dental treatments available. Not to worry, if you fear going to the dentist’s office, you are not alone. Many people let their dental hygiene and oral health suffer simply because they fear going to the dentist office. Whether they have had a bad experience or even if they have a sensitive gag reflex. Sonia provides all these techniques to her patients with comfortable care for people with dental anxiety. There are several different techniques such as Nitrous oxide (more commonly referred to as laughing gas), conscious oral sedation, and IV sedation. The selection used is carefully selected to match each specific individual patient. With these techniques and Sonia’s expertise in the field of dentistry there is now little left to fear in the dentists office.